What Mopar Vehicle Protection Plans Include Road Hazard Assistance? The cost of roadside assistance escalated to a new high over the last decade. Locksmiths, tow truck companies, car rentals, and tire repairs are at an all-time high in occurrence and cost. 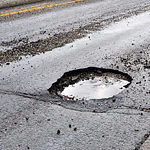 Potholes, road distortions, highway decay, and the increased number of cars on the road has led to more hazardous road systems. The importance of drivers/owners protecting themselves and their wallets is a pronounced element of the times. There are two Mopar Vehicle Protection plans that include roadside assistance, Added Care Plus and Maximum Care. Both plans cover road hazard assistance that provides a $100 allowance per occurrence without a deductible toward emergency fuel, towing charges, battery charging, and tire and wheel changing/repair whether in Mineral Wells or out on the road. To protect yourself from these wallet draining experiences, visit Ram Country Chrysler Dodge Jeep to apply for either the Added Care Plus or the Maximum Care package.